WW Associates designed a new water distribution piping system and water treatment plant upgrades for the Town of Brookneal. The project included a Preliminary Engineering Report, Environmental Report, an electronic WaterCAD model of the Town’s water system, and utility rate and fee structure assistance. Phase I – Water distribution improvements include 23,640 linear feet of 2-inch to 12-inch water line. Water treatment plant improvements include a new raw water intake, filter gallery piping replacement, new flocculators, new chemical feed systems, instrumentation and SCADA controls, finished water pumping, and concrete structural repair. A powdered activated carbon (PAC) feed facility was also designed to address seasonal taste and odor concerns. Phase II – Water distribution improvements design include over 6,000 linear feet of 6-inch to 12-inch water line, three pressure reducing valve vaults to effectively utilize the two distinct pressure zones. Water tank improvements include installing new interior mixing systems, cleaning, sandblasting, and painting the interior of both elevated water tanks, and spot painting the exterior of the tanks. 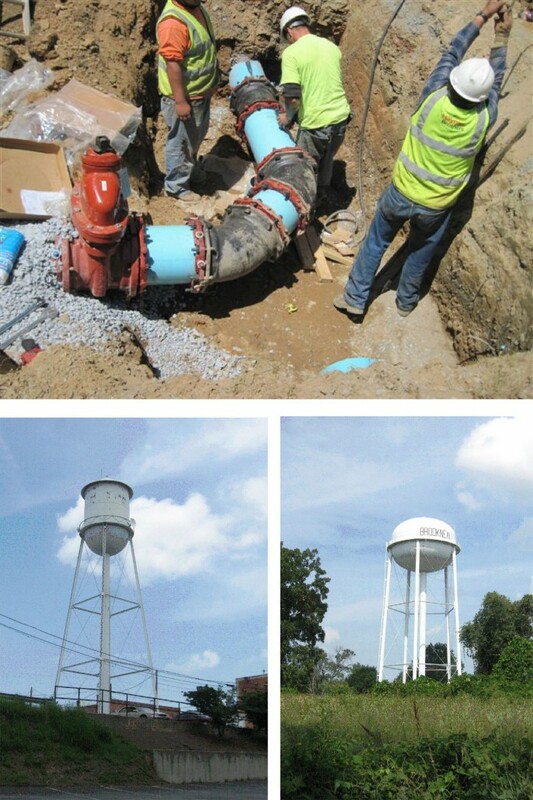 New overflow piping, altitude valve, security fencing, pressure transducer, radio telemetry transmitter, and SCADA system are being added to the existing Main Street elevated water tank.